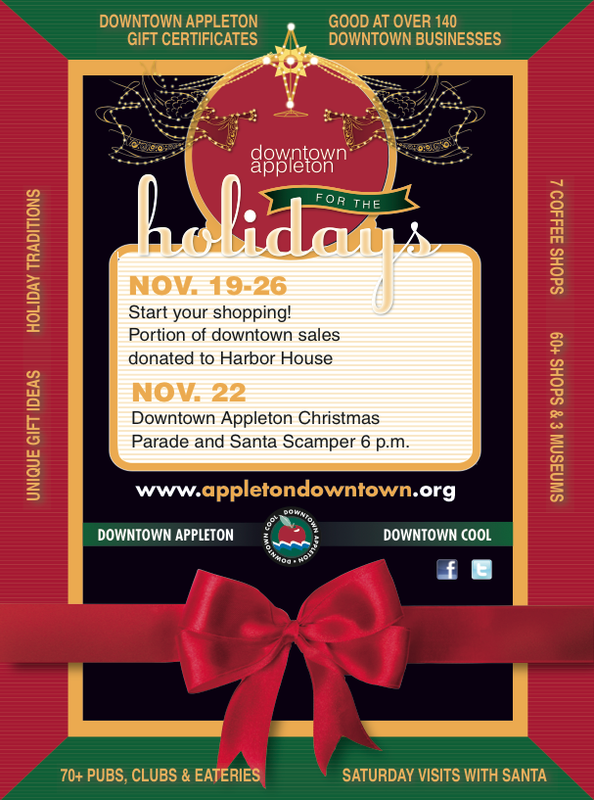 Posted on Nov 12, 2011 by Appleton Downtown Inc.
Start your shopping on Saturday, November 19, 10am - 4pm! Enjoy refreshments as you stroll the Avenue and shop the 60 + unique shops or enjoy the 70+ pubs, clubs & restaurants! Feel good about shopping local and supporting our Independent Businesses while making a difference for Harbor House. Enjoy the decorated windows, sounds of strolling carolers, the Indoor Farm Market inside City Center where you can decorate cookies and don't forget to have your picture taken with Santa (11am-1pm) at Gabriel Furniture. Register to win tickets to the Boston Pops at the Fox Cities Performing Arts Center on Monday, Nov. 28th in all participating businesses! Now that's Downtown Cool! Nov. 19-26, vote for your favorite window display on Appleton Downtown's Facebook page and compare it to the Judge's pick! Remember Downtown Appleton is the place to shop for all your gift-giving needs throughout the holiday season and the year!